Tynrhyd Retreat01970 607913work Self-cateringTynrhyd Retreat offers five-star luxury self catering accommodation. In an award winning barn conversion and renovated farm house set in a private 13 acre estate, it's perfect for family holidays, celebrations, romantic breaks, group weekend breaks and dog friendly holidays. Ideal for a weekend getaway or mid-week break, book a room in the Barn, one of the four houses or the entire Estate. Sleeping one to fifty guests, there’s space for everyone. 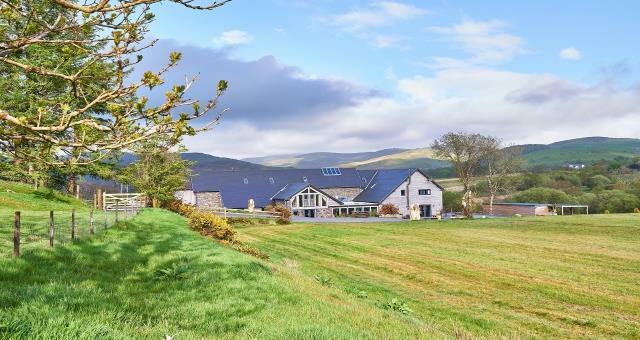 Based in vibrant Mid Wales, conveniently located for the Brecon Beacons, Snowdonia and Cardigan Bay, Tynrhyd Retreat is situated in a beautiful remote location, surrounded by footpaths and open countryside, in an idyllic safe setting for children and pets. Offering peace, seclusion and relaxation the estate offers space, freedom and communal facilities including a luxury garden hot tub, rustic nature trail and Games room. Time spent with family and friends is precious which is why we have created spacious but cosy and warm living areas with a mix of underfloor heating and log burners, equipped with comfortable sofas and chairs for you to make the most of your valuable time together. Each of the fully equipped kitchens has as a minimum a gas hob/oven range, microwave, fridge, freezer; you will find everything you need to enjoy your home-like cooking as well as dining areas in each house. You will also find TV's with DVD player and free Wi-Fi throughout all the properties. All bedrooms are equipped with luxury mattresses and good quality bedding to guarantee a comfortable and relaxing stay. To ensure our guests have a pure luxury experience we provide the softest fluffy towels, and cruelty free 'Myddfai' toiletries which will leave your skin beautifully scented, all made in the Welsh countryside. Tynrhyd is a family owned and run business. Our aim is to provide you with the highest standard of customer service and facilities possible; all you have to do is relax and enjoy your holiday. Set amidst the Celtic Cambrian Mountains, there is plenty to do in the local area for all generations. From lovely walks and cycle trails, quaint villages to explore, boutique shops, golf, fishing to riding lessons and seaside adventures. Nearby attractions include Devil's bridge Falls, Strata Florida Abbey, Aberystwyth Castle, King Arthur's Labyrinth and the Vale of Rheidol Railway. Enjoy fantastic restaurants and country pubs with roaring fires, come home to all the facilities you would expect of a modern rental property. Tynrhyd Retreat is available as a corporate event venue or retreat. With exclusive use of the entire estate and accommodation for up to 50 guests it's a blank canvas for you to create your vision. 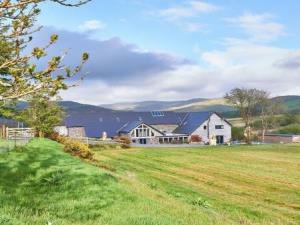 Tynrhyd Retreat offers five-star luxury self catering accommodation. In an award winning barn conversion and renovated farm house set in a private 13 acre estate, it's perfect for family holidays, celebrations, romantic breaks, group weekend breaks and dog friendly holidays. Ideal for a weekend getaway or mid-week break, book a room in the Barn, one of the four houses or the entire Estate. Sleeping one to fifty guests, there’s space for everyone. There is a garden swim spa hot tub onsite which can accommodate 10 guests; bike storage, separate drying room and wash down facilities. Take the A470 (or coast road) to Dolgellau, take the A487 to Aberystwyth then follow the A4120 to Devil’s Bridge. Follow the signs from Chester to Wrexham, Oswestry, Welshpool then Aberystwyth. At Aberystwyth take the A4120 to Devil’s Bridge. Less than 2 hours’ drive from the Midlands. From the M54 / A5, follow signs from Shrewsbury to Welshpool and head towards Aberystwyth on the A44. At Ponterwyd take the A4120 towards Devil’s Bridge. Proceed through Devil’s Bridge for half a mile. Turn left on the bend/junction. We are the first property on the right. M5 to Birmingham and then as from the Midlands. M4 to Carmarthen, take A487 the coast road to Aberystwyth. At Aberystwyth follow the A4120 to Devil’s Bridge.